Snom, the IP telephony specialist from Berlin, presents its D3xx series flagship, the D385 desk phone. This sleek, premium IP desk phone is equipped with a tiltable, high-resolution 4.3” colour TFT display, which can show information and images such as the company logo and current user identity. The D385 boasts an additional, true paperless screen displaying options and status of the 12 configurable function keys with dual-colour indicators. 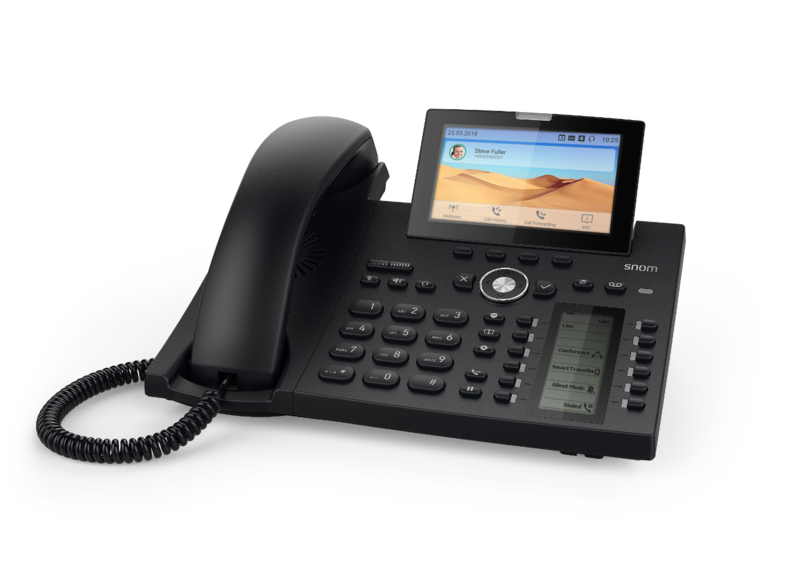 Snom’s latest addition to the D3xx series, the executive D385 IP desk phone, meets all the requirements of a business IP phone and combines them in an elegant cutting edge design. The D385 boasts a gently inclined, European-style keypad for easy dialling and a 4-way directional pad with a premium feel for navigating through the graphical user interface. 12 freely programmable, self-labelling physical function buttons (with 4 different allocations – 48 in total) offer easy access to various frequently-used tasks such as extension, speed dial, redial, forwarding and presence indication (such as DND – do not disturb). The D385 is extendable with the D3 expansion module via its USB port, which adds an additional 18 configurable, self-labelling LED buttons and a high-resolution display with backlight, keeping the inclined profile of the D385 and ensuring a seamless appearance. The D385 features a 2-port Gigabit Ethernet (IEEE 802.3) switch for connecting network devices together. Thanks to its high-speed USB port, the D385 can be fitted with a USB Wi-Fi stick for even greater flexibility when positioning the phone. What is more, it can be equipped with a USB DECT Dongle such as the Snom A230 for use in conjunction with DECT headsets like the Snom A170 for even greater versatility. Built-in Bluetooth connectivity makes it easy to connect third party wireless headsets as well. The integrated Digital Signal Processor (DSP) guarantees an excellent audio performance in true wideband HD audio quality for crystal-clear calls, and the same wideband audio quality is also present in its hands-free mode. The D385 supports Power over Ethernet standards such as IEEE 802.3af, Class 3, which reduces cable-clutter and makes installation much easier. Supporting the latest security standards such as TLS & SRTP, Dual Stack IPv4/IPv6 and VPN support, the D385 also offers great security.